Galveston's Strand was the city's primary commercial area during the second half of the 19th century. A thriving, energetic and prosperous district, it developed alongside the shipping channel and port that helped make the city the largest metropolis in the state during those years. Galveston's prominence began to taper off in the early 20th century as the Houston Ship Canal diverted port traffic. Fortunately, the growth of its rival, Houston, meant the survival of a number of buildings that might otherwise have been demolished for larger replacements. Remaining buildings, many of them restored in recent years, display the range of architectural styles popular during the Victorian period. 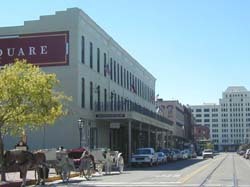 Notable buildings include Hendley Row, adjoining buildings constructed from 1858 to 1859, now the oldest commercial buildings in Galveston; the 1870 J. S. Brown Hardware Company Building, at one time the largest hardware firm south of the Mason Dixon line; the Rosenburg Building which housed the largest dry goods store in Texas in the 1870s; and the 1884 W. L. Moody Building, built by cotton broker, banker and state legislator Colonel W. L. Moody. The Strand Historic District, a National Historic Landmark, is roughly bounded by Ave. A, 20th St., the alley between Aves. C and D, and the railroad depot in Galveston. The 26-square block district contains more than 100 shops, restaurants and art galleries. Several tour companies offer guided tours. For more information visit their website. 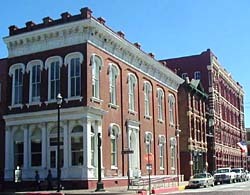 Some of the Strand's historic buildings have also been documented by the Historic American Buildings Survey. The Tremont House, located in The Strand Historic District, is a Historic Hotels of America member, a program of the National Trust for Historic Preservation.